So, we all know what Amazon is, right? Now we know the richest man in the world - here he is, Jeff Bezos with his wife - he filed for divorce. It’s amicable so far, releasing a statement saying, “If we knew 25 years ago, we would do it all again.” But a new development – will this change the way they’re handling their divorce -- after the break. But now, a potential, huge new development in the divorce, will the positive feelings change? According to TMZ, no pre-nup, and the couple will reportedly file for divorce in Washington State which is a community property state. That means, all of the income and earnings the couple incurred during their 25-year marriage will be split down the middle, 50/50. We’re talking about billions of dollars. 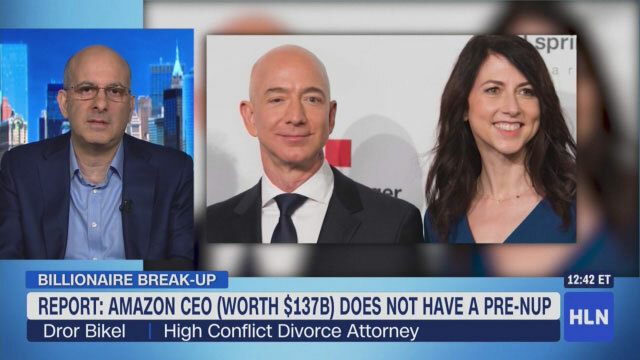 And with Jeff Bezos’ estimated worth, $137 billion, we could be talking about a massive payout to the wife. I want to bring in Dror Bikel, an attorney who specializes in high conflict divorce. He joins me now. Dror, good to see you. Susan: This is a divorce where billions are at stake. They met 25 years ago, apparently building this together and working as a team. They have several children, as well. Could this remain amicable where there are no attorneys involved here if they agree to something? Dror: There are certainly going to be attorneys involved. The marital estate is the largest in history, the largest in the world and worth approximately $140 billion. To untangle that, to give each side the assets that they have a right to, it’s going to require a team of attorneys and accountants. And, likely, they’ve probably talked about it extensively and, perhaps, even worked it out before they issued that press release. Susan: Yeah, that makes sense. I am going to bring up Donald Trump here, and here’s why. He said, he was asked about this divorce, “I wish him luck. I wish him luck. It’s going to be a beauty.” We know that he has experience, Donald Trump, in divorces. When you represent someone, do you recommend that they not talk to the press if they’re a high-profile couple? Do you see Jeff Bezos coming out and talking about this in public beyond that statement? Susan: And there is word, I say, “allegedly,” that there is another person involved here, meaning another relationship with Bezos, him saying they were separated for some time here. If that’s not an issue on either side, though, they could still, as you said, have come to an agreement way before this public statement came forward. So, that could not play in. Dror: That’s exactly right from a legal perspective. In other words, Washington, which is the state that has jurisdiction, is a no-fault state. So, adultery is really irrelevant to the distribution of assets. However, if one side feels aggrieved, and I’m not saying anybody does in this case, but if one side feels aggrieved for whatever reason, that can turn what would otherwise be an amicable divorce to a divorce that may not be so amicable. So, those are things that I would not advise anybody to play out in the press, meaning new relationships, to become public and to play out in the middle of sensitive divorce negotiations. Susan: Because, as you know, it can get ugly, and it’s best to do it behind closed doors if you will, which it appears, so far they have. Dror Bikel, thank you for your input on this. Dror: Thank you so much, Susan.